If automatic transaxle assembly parts are replaced, refer to Parts Replacement Compensation Table to determine if any additional operations are necessary (See page ). See the steps from "Recover Refrigerant From Refrigeration System" through "Remove Engine Assembly with Transaxle" (See page ). 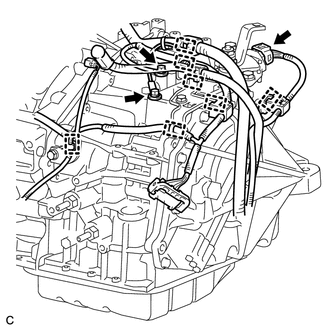 (a) Remove the 2 bolts and disconnect the 2 wire harnesses from the automatic transaxle assembly. (b) Separate the park/neutral position switch assembly connector and 7 wire harness clamps from the automatic transaxle assembly. 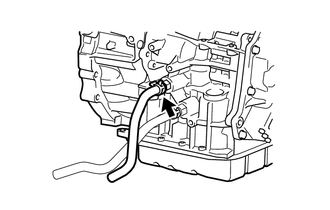 (a) Remove the bolt and flexible hose bracket sub-assembly from the camshaft housing sub-assembly LH. (b) Remove the No. 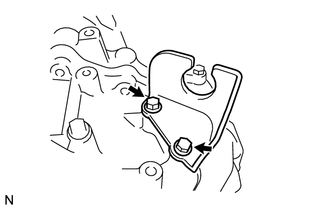 1 breather plug (ATM) from the flexible hose bracket sub-assembly. 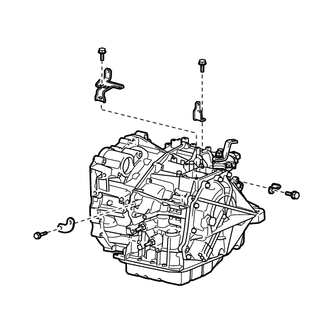 (a) Remove the 11 bolts and automatic transaxle assembly from the engine assembly. 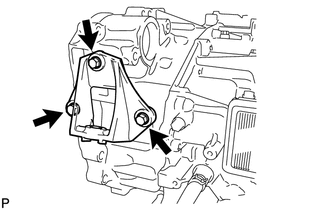 To prevent damage to the 2 knock pins, do not pry between the automatic transaxle assembly and engine assembly. 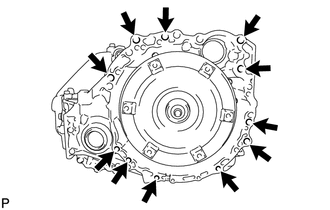 (a) Remove the torque converter assembly from the automatic transaxle assembly. (a) Remove the 3 bolts and front engine mounting bracket from the automatic transaxle assembly. 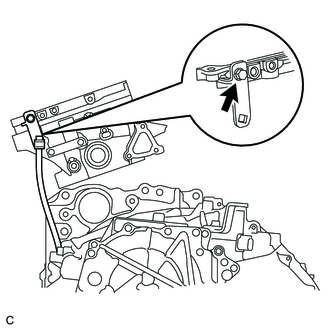 (a) Remove the 4 bolts and 4 wire harness clamp brackets from the automatic transaxle assembly. (a) Remove the 2 bolts and No. 1 transmission control cable bracket from the automatic transaxle assembly. 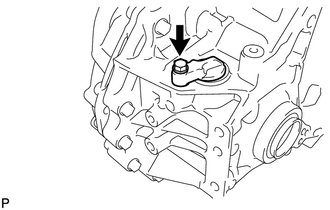 (a) Remove the bolt and speedometer driven hole (ATM) cover sub-assembly from the automatic transaxle assembly. (b) Remove the O-ring from the speedometer driven hole (ATM) cover sub-assembly. (a) Slide the clip and disconnect the No. 1 oil cooler outlet hose from the automatic transaxle assembly. (a) Slide the clip and disconnect the No. 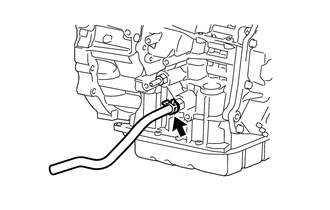 1 oil cooler inlet hose from the automatic transaxle assembly.